Andrea's World Reviews: WrestleMania 33!! This year I finally fulfilled a lifelong dream of mine. I have been a wrestling fan since literally as far back as I can remember. We attend every WWE even that comes within a few hundred miles of us. It is always special. This time though, it is earth shattering. This year it was not just a show, it was The Show of Shows. WrestleMania!! Any real WWE fan dreams of going to WrestleMania. It is the Super Bowl of wrestling. This event was literally life changing for me. From the moment we arrived it was magic. From the larger than life stage, to the 75,000+ people to the awesome commemorative chairs (VIP seats only.) The energy was incredible! Of course, the show was fantastic. 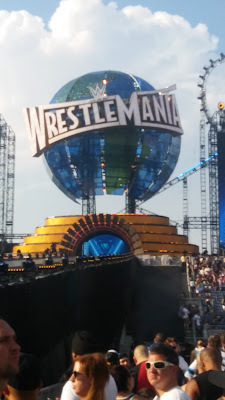 We were so close to the ramp that we got a great view of everyone's entrance, and an even better view when they walked back up the ramp (on the side) to go to the back. I took literally thousands of pictures. It is so hard to choose the best ones for this recap. I will start at the beginning. The first match (which was the pre-show) was Austin Aries vs Neville for the Cruiserweight Championship. It was a great match, lots of high flying and fast action. I was rooting for Aries, but Neville retained. Even still, it was the perfect way to start the show. Next (still on the pre-show) was the Andre The Giant Memorial Battle Royal. This was busy and exciting match. Everyone I was rooting for got eliminated, which was disheartening, but there was a weird twist with Rob Gronkowski coming out of the stands into the ring to interfere in the match, helping Mojo Rawley (his friend) to win. Next was one of the matches I was most excited for. I was pretty upset because this match was bumped to the pre-show after fans complained online about another match on the card that was supposed to be on the pre-show instead. Dean Ambrose vs Baron Corbin for the Intercontinental Championship. Thankfully, Dean won. He is my favorite in WWE right now. The match was really good, and should have been on the main card. This is when the actually event begins, surprising since so much awesomeness had already happened. The first match on the main card was another one I was super excited for: Shane McMahon vs AJ Styles. I love Shane and AJ, so I knew I would be happy with the outcome either way, and I knew that AJ would win. He did. It was a phenomenal match. One of the most exciting of the night. Great way to start the main show and get the crowed pumped up. Next up was the United States title match: Kevin Owens challenging Chris Jericho. This match had a lot of action. There is a lot of animosity between the two, so the match was intense. In the end, Kevin Owens defeated Chris Jericho to capture the United States Championship. I am a fan of both. I kind of like that Owens won. Jericho is a legend, he does not really need the title to show his status in the company. Next came the Raw Women's Championship match. A Fatal 4-Way with Bayley defending against Nia Jax, Charlotte Flair and Sasha Banks. At this point, the kids had to go to the bathroom and get a snack, which took forever. We missed the entire match, but Bayley retained the title. We also missed the beginning of the next match. Ladder match for the Raw Tag Team Titles. I was super bummed hearing the entrance of Enzo and Cass but not being able to see it, but it only got worse. The Hardy Boyz, my favorite tag team EVER, made their surprise return, and I missed that entrance too. I was crushed that I missed the Hardy's entrance, but at least they won the match. The match was awesome, full of high risk moves (like any good ladder match). Jeff went above and beyond, like he always does. Very cool to see live. Next was The Miz and Maryse vs John Cena and Nikki Bella in a mixed tag match. I don't like Cena very much and I cannot stand Nikki Bella, plus I love the Miz, so I was rooting for him and Maryse, but I knew they wouldn't win. I was right. Of course after the match, Cena proposed to Nikki, which was supposed to be a surprise but the whole crowd knew it was coming. That was boring. Next was Seth Rollins vs Triple H. This is another of my favorite matches on the card. I love Seth Rollins. I have loved Triple H since I was very young, but he currently plays the part of a heel to perfection, making you want to root for Seth. Seth won the match when Triple H accidentally knocked his wife, Stephanie, off the ring apron (as she was trying to interfere.) Triple H was distracted and Seth made the most of it. Really exciting match and perfect ending. Next the WWE Title Match between Bray Wyatt and Randy Orton. Another match where I love both superstars. I wanted Bray to win since he had just won the belt and wanted him to keep it for a little while. Randy ended up winning. I wanted Bray but I was was fine with Randy winning. The match was really cool. I loved the lights going down and the special effects every time Bray went upside down. "Bray Vision." Next was Brock Lesnar vs Godlberg for the Universal Championship. I don't like either one of them and I am mad that Goldberg was the champion and that either of them had the opportunity at the title. Thankfully, this match was short. There were a few "power moves" and it was over. I didn't really care for it. Brock won, like I expected. Unless a 3rd person entered the match and won the title, I could not have been pleased with the outcome. The main event was Roman Reigns vs The Undertaker. I do not like Reigns at all and I was actually upset that he was even in a match with The Undertaker at WrestleMania, since that is Undertaker's legacy match. My biggest fear (expectation) was realized when Roman defeated The Undertaker. Though he was no longer undefeated at WrestleMania, a loss to Roman is still a slap in the face to the incredible career that The Undertaker had in WWE and at WrestleMania. It is especially upsetting since after the match The Undertaker left his hat and coat in the ring, as if to symbolize his retirement. As upset as I am about who he faced and that he lost in his last match, I am still very thankful that I got to be there live to witness the last ever entrance, match and exit of the Undertaker. I will never forget it. While there were a few people I don't like, that is part of the experience, it is just as thrilling to boo someone you hate as it is to cheer on your favorites. All the energy of all the other fans around you is electric. It is indescribable. This is an event that my family and I will remember forever. I know the rest of this review did not really mention my families reactions to the matches and such, and that was just because giving 4 different opinions on each match would make forever. We were enthralled throughout the show. My 5 year old daughter and I were the most excited as we are the biggest WWE fans in our house. Hubby and son need to step up their games, lol. If you are considering any WWE live event, especially WrestleMania, I cannot recommend it highly enough. There is literally nothing else like it. It is incredible. It is unforgettable. We will definitely go again if we ever have the chance, and I we will certainly go to the next WWE event in our area. Have you ever been to WrestleMania? 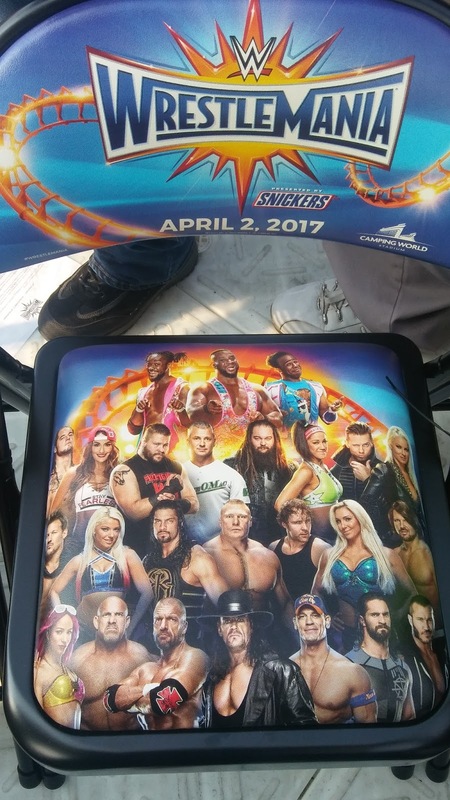 Another WWE event? I would love to hear about it in the comments. I love to discuss WWE. great share, thanks for posting! !